Important information getting into mainstream media. 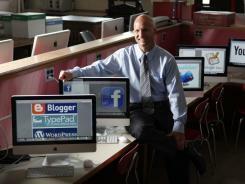 Among educators, Eric Sheninger is something of a social networking hero. The principal of New Milford (N.J.) High School has nearly 12,300 Twitter followers (his handle: @NMHS_Principal). He and his teachers use Facebook to communicate with students and parents, and students use it to plan events.